The accident season might seem like a series of coincidences, except that it happens every October. Sometimes there are just more bumps and bruises. Sometimes bones are brokern. And in the really awful seasons, tragedy strikes. Seventeen-year-old Cara worries this is going to be an especially bad year and wonders if it might have anything to do with Elsie, who was her best friend in the year after Cara's father died. While searching for Elsie, accidents keep occurring and no one in Cara's family is immune to injury. No amount of extra clothing or hiding of sharp objects helps protects them from physical harm, or from the secrets that come to light along the way. Fast-paced and intriguing! For fans of "We Were Liars"and "The Ocean at the End of the Lane"comes a haunting magically realistic debut about a family caught between a violent history, a taboo romance, and the mysteries lurking in their own backyard. Every October Cara and her family become inexplicably and unavoidably accident-prone. Some years it's bad, and some years it's just a lot of cuts and scrapes. This accident season--when Cara, her ex-stepbrother, Sam, and her best friend, Bea, are 17--is going to be a bad one. Cara is about to learn that not all the scars left by the accident season are physical: There's a long-hidden family secret underneath the bumps and bruises. 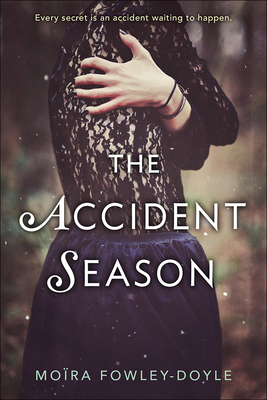 This is the year Cara will finally fall desperately in love, when she'll start discovering the painful truth about the adults in her life, and when she'll uncover the dark origins of the accident season--whether she's ready or not. * "Ghosts, secrets, and magic collide in this Irish author's astonishing debut . . . a moving portrait of a fractured family, knitting itself back together with courage and love. A powerful novel from an exciting new talent." --"Kirkus, "starred review. Moira Fowley-Doyle is half-French, half-Irish and lives in Dublin with her husband, their young daughter, and their old cat. Moira's French half likes red wine and dark books in which everybody dies. Her Irish half likes tea and happy endings. Moira started a PhD on vampires in young adult fiction before concentrating on writing young adult fiction with no vampires in it whatsoever. She wrote her first novel at the age of eight, when she was told that if she wrote a story about spiders she wouldn't be afraid of them anymore. Moira is still afraid of spiders, but has never stopped writing stories.